Quietly and with little fanfare, some of Sri Lanka's most ancient traditions are showing signs of fresh vitality after many long years in decline. Even as Sri Lankan Buddhists celebrate the introduction of Buddhism 2300 years ago, so likewise the island's indigenous people have something to celebrate during 1993, the International Year for the World's Indigenous People. And much of it has to do with archaic yet living traditions connected with the great wedding celebration of the Wanniyal-aetto maiden Valli to the living spirit of Kataragama. No one knows for certain how long island Lanka has been home to its clans of Wanniyal-aetto, the indigenous people of the Yaksa Gotra. According to some accounts, they descended here from another loka or realm of existence. Quite possibly they walked to Lanka from the Asian mainland during one of the ice ages when sea levels were low enough to expose Adam's Bridge as recently as seven thousand years ago. Sri Lanka's first people, the Veddas or Wannniyal-aetto ('forest-dwellers') as they call themselves, have lived in Lanka for so many thousands of years that they no longer recall how they arrived. Like other indigenous people of the Yaksa Gotra, they claim to be direct matrilineal descendants of their great mother-ancestor, Queen Kuveni of ancient days and even further back to remote prehistoric times when the Nae Yaku or great ancestral spirits walked upon the earth. They were the original wanni nayakas or Lords of Lanka's vast jungle interior. The cultural heritage of the Wanniyal-aetto preserves ample evidence of some great events which occurred here in remote prehistoric times. These traditions are not mere memories but living schools of wisdom that explore many subtle dimensions bursting with limitless spiritual energy accessible to those seers and knowers who are hunters of wisdom. 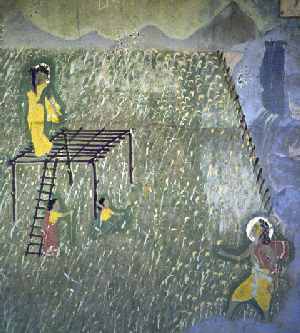 Among the nae yaku or spiritual ancestors of the Wanniyal-aetto, the greatest is said to be Kande Yaka, the terrific Spirit of the Mountain who is respected by Sinhala and Tamil communities alike as Kanda Kumara or Murukan, the ever-playful Eternal Youth of Kataragama. In South Asian lore, he is also the divine general Skanda or Karttikeya, whom many have compared with the historical al-Sikandar or Alexander the Great, the youthful lance-bearing student of Aristotle whose compact army conquered half of the ancient world in the 4th century BC. According to indigenous accounts, the great yaksha or spirit of Kataragama is an alien divinity or presence that came to Lanka long ago from some place far away. One tradition, for instance, declares that he descended from the sky and landed upon Adam's Peak, stood there for a long time, and then followed the path of the great gajas or elephants to Gajaragama (Kataragama), 'the home of the elephants' There on the bank of the Menik Ganga, he planted his spear in the earth, sat down, and has remained ever since. Kataragama therefore claims to be the first puranagama or indigenous settlement. "When he came, he told us the names of things, trees, and animals, and how we should make offerings and dance to him when going into the jungle, and at other times. He told us everything we know." To this day, the institution of pada yatra or foot pilgrimage is closely associated to Kataragama and its ancient mystery tradition. Starting with the great Kanda Yaka himself, countless generations of adivasis and other pilgrims have followed in the great god's very footsteps. In the legend of Kataragama, the terrific Spirit embodies itself forth in human guise as a handsome young stranger who seems to be hunting deer with bow and arrow. In fact, however, he comes expressly in search of Valli, the human daughter of an enchanted red deer who is, therefore, also a magical deer of sorts herself. The Wanniyal-aetto tribal chieftain Nambi Raja, who found the infant girl in the forest and raised her as his own daughter, instructs his darling daughter-princess to guard a chena-field of ripening millet at nearby Sella ('little') Kataragama. Armed only with her sweet voice and a stone sling, her duty is to chase away marauding birds and wild animals. Valli grows up in the company of other maidens like herself, but she differs in that she has taken a vow in private to marry no one but the great God of the Mountains himself. She sings at the birds and animals to keep them away from the crop of millet, but this also attracts the attention of Kanda Yaka who is lurking, listening and watching from nearby. Pretending to be tracking a deer, Kanda Yaka approaches boldly, but his striking appearance only alarms Valli, who bids the stranger to be gone at once. Meekly, he apologizes for intruding and explains that he is following a she-deer (who is none other than Valli herself). Still, she doesn't recognize the love of her life in the strange hunter, but bids him to depart and abuses him for straying into her chena-field. The core of the pre-historic mystery-romance of Kataragama is the story of how the cunning hunter god appears as a stranger and lives unrecognized among the Wanniyal-aetto even while clandestinely wooing the chieftain's beautiful daughter Valli. 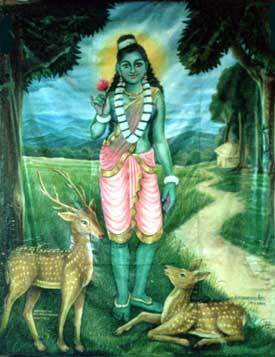 Gradually and stealthily, the great god reveals himself to Valli, who is amazed at his transformations. In a timeless love story deep in mystical content, the 'impossible' courtship between a young maiden and the age-old deity actually comes true. The holy couple, now madly in love, were meeting daily while Valli's male relatives were away hunting and gathering wild honey. But finally harvest time came and Valli was called to rejoin her kinfolk. When her divine lover appeared that evening and did not find his beloved Valli, he was extremely distraught. Weeping and calling her name, he felt exactly what it is like to be a human being deprived of one's beloved companion in life. The pathos of this scene has provided rich material for local song and poetry ever since that day in remote pre-history. The hunter-god did recover his composure, however, and headed straight for the Vedda chieftain's camp in Kataragama. Under cloak of darkness, the divine stranger slipped into the jungle camp, woke the girl, and "stole" her away. At once they fled and eloped into Deviyange Kaele, the 'God's Own forest'. Before too long, the chief and his men woke up to realize that the friendly stranger was really a terrible rogue. Raising a hue and a cry, they seized their weapons and gave chase. Some versions say that the armed and angry tribesmen caught up to the mysterious couple at Suran Kotte (present-day Kirivehera) and a battle ensued. The pursuers first released a barrage of a angry oaths and abusive epithets, followed by a volley of arrows. But tradition recalls that all their barrages turned back upon them and left them dead or senseless by some enchantment cast upon them by the fierce Spirit of the Mountain seeing Valli's distress at the sight, however, Kande Yaka bid her to restore her kinsmen to life, which she did by mere touch. When they came to their senses, the Veddas understood that this "rogue" was none other than the terrific Kande Yaka himself. They fell down again in terror and worshipped him out of dread of his awesome power and could not stand up in his Divine Presence. Gradually their fear gave way to adoration and admiration for his grace and uncanny ability to transform every obstacle laid before him. Needless to say, the mysterious stranger's marriage to the chieftain's daughter was instantly approved. Red-hot anger turned into ecstatic joy, and the triumphant procession or perahera returned all in one unforgettable night that would be remembered and re-enacted for thousands of years to come. That same day, fleet-footed messengers spread the incredible news far and wide. 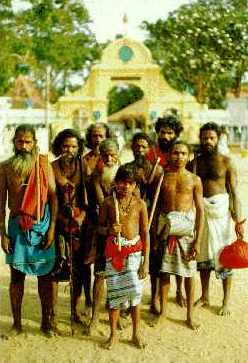 Every Wanniyal-aetto man, woman, and child in all of Deviyange Kaele came at once on foot to Kataragama in what must surely be the origin of the Pada Yatra or foot pilgrimage to attend the divine couple's holy wedding festival. The great wedding, like all indigenous weddings, was and still is a simple exchange of vows with gifts followed by a riotous feast with singing and dancing and very manner of celebration suitable to the joyous occasion. This is the origin of the Esala festival. This theme of the exchange of vows between the human soul and the god repeats itself daily in Kataragama or wherever human hearts yearn for intimate contact with higher orders of reality. The vow, oath, or promise, as Valli and so many other have since learned, works powerful magic and can accomplish great marvels indeed. The kap hitaweema or tree-planting ritual of unspoken promise to re-enact Valli's courtship and marriage is one fine example. The god, it seems, loves those who are faithful to him. The structure of the story of Valli's dramatic romance and marriage to the Kataragama god suggests that Valli herself is the original narrator who has told and re-told her marvelous story from many different perspectives, inspired no doubt by the super-abundance of divine grace bestowed upon her by the loving Spirit of the Mountain. The Spirit, in a sense, spoke to Valli and through her to countless human generations right up to the present day. In the indigenous traditions of the Valli Amma Parampara, Lady Valli is held in respect and reverence no less than her lord. For although she was a mere adolescent girl at the time, she captivated and tamed the terrible spirit of the Mountain and actually transformed him into a beloved kinsman. Ever since then, Kande Yaka or Kataragama Deviyo has been considered to be the great champion of the Veddas and all who honor the divine mystery tradition transmitted handed down from Valli Amma herself. Patrick Harrigan has been acting editor of the Kataragama Research Publications Project since 1989.